The tail of an American Airlines passenger jet. American Airlines has severed its decade-long ties to online travel giant Orbitz, in a move that experts said could shake up the global travel industry if other airlines follow its lead. (AP) -- American Airlines pulled its flights from the Orbitz travel website on Tuesday in a dispute that could eventually affect the way travelers buy airplane tickets online. The airline said its tickets sold previously on Orbitz are still valid. And American Airlines tickets can still be bought at the airline's own website as well as other travel websites. American pulled its tickets from the Orbitz for Business site as well. The dispute is the latest sign of strains between airlines and the companies that sell airline tickets, including online sellers like Orbitz. Airlines have traditionally paid sellers a commission. American also pays fees to the global distribution companies that provide the flight information. Now, American wants Orbitz to get that flight information directly from the airline, cutting out the global distribution systems. American has said that will reduce costs and also allow it to make more personalized offers to customers such as hotels and car rentals. The global distribution systems have not moved as fast as they could have to upgrade their technology, but American's move with Orbitz is "rather severe," said Henry Harteveldt, a travel analyst for Forrester Research. "It seems like they want to scorch the earth." He predicted that travelers who want to fly on American will seek out its tickets on the airline's website. Travelers who don't know what happened with Orbitz, or don't care which airline they fly, are unlikely to notice American's absence from Orbitz, he said. Traveler advocates have said American's move will make it harder to comparison shop. "There is profit in confusion, there is profit in fragmentation of all the fares and the fees so consumers can't comparison shop," said Kevin Mitchell, chairman of the Business Travel Coalition, which represents corporate travel buyers. He said airlines ultimately would like to flip the current financial arrangement around and have travel agents pay them for access to flight information, rather than American paying every time someone else sells a ticket on one of its flights. 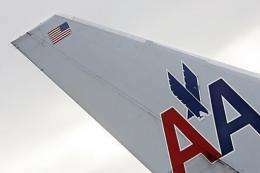 American's vice president for sales, Derek DeCross, said in a statement that the airline needs to be "free to customize its product offerings to improve the customer experience as well as distribute its products in a way that does not result in unnecessary costs." American had threatened to pull out of Orbitz on Dec. 1. But Orbitz got a state court judge in Chicago to block the threat temporarily. It made its move on Tuesday shortly after judge Martin S. Agran declined to issue an injunction. Agran ruled that any breach of contract can be sorted out with a lawsuit later. The request to block American was brought by privately held Travelport Ltd., which owns 48 percent of Orbitz. It also runs two of the biggest so-called global distribution systems, Galileo and Worldspan. American spokesman Ryan Mikolasik said it has been negotiating with other online ticket sellers. The Orbitz negotiation was made more difficult because of Travelport's involvement as owner of the two global distribution systems, he said. Orbitz Worldwide Inc. called American's decision "unfortunate" and said it still offers flights from more than 400 airlines worldwide and would continue to seek a way to sell American tickets, too. It said American Airlines tickets add-ons like rental cars and hotel rooms added up to about 5 percent of the company's revenue for the nine months that ended Sept. 30. It said it believes that any American Airlines tickets it loses will be replaced by tickets on other airlines. Shares of American parent AMR Corp. rose 14 cents to close at $8.05. Orbitz shares rose 22 cents, or 3.5 percent, to close at $6.44, but then fell 16 cents, or 2.5 percent, to $6.28 in aftermarket trading. Also Tuesday, Delta Air Lines Inc. said it would stop selling tickets through three smaller travel websites, CheapOAir.com, OneTravel.com, and BookIt.com effective on Dec. 17. Last week a Delta executive told analysts that some ticket venues have more value than others. The airline wants "as direct a relationship and channel to our best customers as we can," said Glenn Hauenstein, Delta's executive vice president for network planning, revenue management, and marketing. He said he's aiming for Delta's own website to be more like an Apple store and suggested that other travel websites are more like Best Buy, with similar products, but a different customer experience, he said.